Firefighters rescued a man and his bulldog from the second-floor window of a fourplex at Aylmer and Wolfe streets Tuesday night after a fire broke out in the apartment. The man, in his 60s, was taken by paramedics to Peterborough Regional Health Centre by ambulance, where he was treated for smoke inhalation. Platoon chief Paul Graham said the fire happened when a radio that was sitting on top of a microwave oven shorted out and caught fire. The fire broke out around 8 p.m. When firefighters arrived, the man was in the window of his second-floor unit. Firefighters climbed a ladder and the man handed his bulldog over to firefighters for rescue before allowing himself to be assisted out of his apartment, Graham said. One other man had been in the apartment at the time: Graham said he escaped and was treated at the scene for smoke inhalation by paramedics. Firefighters also removed five dogs and one cat from the building. The cat was given oxygen on the scene and taken to a veterinarian at the Jackson Creek Pet Services. Graham said the fire was contained to the one second-floor apartment. He estimated that the damage at about $50,000. 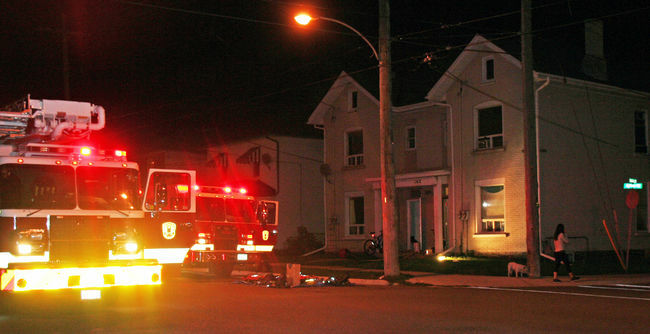 Other occupants of the four apartments in the brick building – located on the southeast corner of Aylmer and Wolfe streets – escaped unharmed, despite the fact there were no smoke detectors in any of the apartments, Graham said. About a dozen people, seven dogs and three cats were milling around the scene Tuesday night. Tyler Koke, 23, lives in the building and got out safely with his large Labrador-husky mix Lua and his 20-year-old cat. Koke, a history student at Trent University, said he’s only been living in the building about a month. He said that if he couldn’t stay the night, he would drive to his parents’ home in Port Hope. 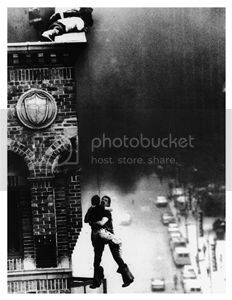 Josh Millner, 24, arrived home from his work shift at Harvey’s on Lansdowne St. to find firetrucks surrounding his building. He lives on the second floor in the apartment next to the one that caught fire. He says firefighters escorted him in to retrieve his dog, Jazz, a Jack Russell, pug and chihuahua mix. He said that when he arrived home he was “kind of petrified”. “If it had been my apartment on fire, my dog would have been dead,” he said. Platoon chief Graham said some tenants would be allowed to return to stay overnight in their apartments Tuesday. The Peterborough City-County Disaster Trust Fund was called in to provide accommodation for those not allowed back in their apartments.